The Champagne house of Legras & Haas may be relatively young, but its experience in winemaking is generations old. IN a cool, dark cellar in France, there are a few bottles of Champagne from 1959. The brand Legras & Haas can be traced back to seven generations of vine growers and three generations of winemakers. Therefore, it is hardly surprising when Jérôme Legras of the Champagne house tells us about his grandfather’s legacy, bottled and kept for three generations and counting. “But all Champagnes have a shelf life, a use-by date. No wine is immortal. Some wines are close to immortal, but they are living things and they all have a date where they won’t be good any longer,” says Legras, the youngest of three sons of François Legras and Brigitte Haas, the husband-and-wife team who founded the Champagne house in 1991. The difference between Champagne and still wine involves a second fermentation in the bottle. After the grapes are harvested and pressed, the juice undergoes the first round of fermentation in vats before it is bottled. In the bottles, a second round of fermentation occurs, which essentially means that there is still much going on inside the bottle and you will get a glass of Champagne that tastes different depending on when you decide to pop the cork. “Champagne is sparkling wine that acquires its bubbles during a second fermentation in the bottle. Once the product is technically finished, it’s by no means Champagne yet. 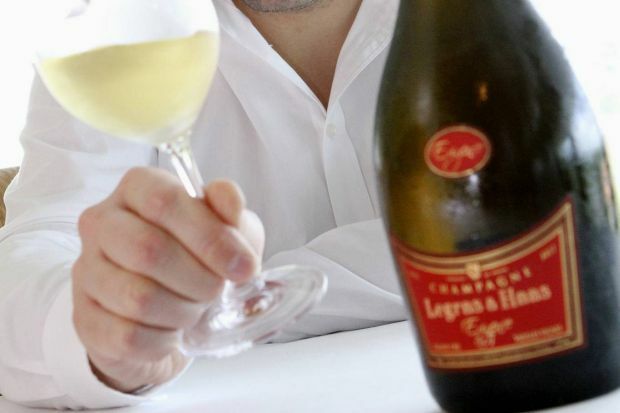 The ageing process is really crucial for the wine to acquire its complexity,” says Legras, who was recently in town to promote a selection of Champagnes from Legras & Haas that are now available, for the first time, in selected stores in the Klang Valley. For most high-quality wines, we are looking at a shelf life of several decades, although in the case of the Champagne made by Legras’ grandfather, it is now in a state that is probably nothing you would find in a wine shop. “The colour is much darker than it was before. There are some bubbles, but only very few. The taste ranges from tobacco to leather, from melon to nuts. They are not fading flavours, they are still lively,” he says. We sat down to a Champagne pairing session at Chynna in Hilton, in Kuala Lumpur. After trying the Legras & Haas Brut Tradition, Extra Brut, Rosé and Exigence, my glass was whisked away and a larger one put in front of me. In wine tasting, size does matter – at least, in the context of how big the opening of the bowl is. This glass was specifically chosen for the Legras & Haas Grand Cru Millésime 2005, a young vintage. This pale gold Champagne is a Blanc de Blancs, a French term meaning “white of whites” that is used to designate Champagnes made only from Chardonnay grapes. Legras describes a Blanc de Blancs as more fresh and citrusy than blends (Champagne made with more than one kind of grape). “It is not as versatile as blends such as the Tradition and Exigence, which are very well-balanced Champagnes and much easier to pair with almost everything. A Chardonnay-only Champagne will have a much more obvious pairing with food, but they will not be as chameleon as blends,” he says. Being a young vintage, the cork was popped and the bottle allowed to stand for around two hours before serving. “This Champagne is seven years old, but it is still quite into itself and still quite shy. You need this bigger glass so you have better access to the aromas. Some people decant the alcohol, but that tires the wine a little and it isn’t good for the structure, so it’s often better to put it in a big glass instead,” explains Legras. With his grandfather’s Champagne in mind, I asked what would happen if we had this millésime, with its floral and citrus tones, and a lingering finish, 10 years from now. “Visually, the colour will be from a pale gold to a deeper shade, due to oxidation. The aroma will evolve and ripen – the lively fruity aroma will fade and be replaced by something reminiscent of cooked orange peel. The flavours will deepen, it will go from fresh fruit to marmalade, from perfume to honey,” he says. The Champagne will be good for a couple of decades, and then it will decline. At that stage, Legras predicts that it will be less balanced and the complex flavours will become more dissociated. As Champagne continues to develop and evolve in the bottle, how would one know the best time to open it? Legras & Haas releases its Champagnes at a time when it thinks they would be best to drink. Generally, you can’t go wrong with the “buy today, drink today” mantra, although there is the option of waiting some time with the vintage Champagnes. “We release vintages at their first spike of maturity, when they are young, very fruity and acidic. At this stage, they make for extremely easy drinking. In their lifetime, they will have several spikes of maturity … and his repeats until a time when they just drop. The Champagne will then no longer swirl in your mouth, it will not feel lively. But for such a wine as the Grand Cru Millésime 2005, it will take a few decades, so don’t worry,” Legras says. So if you buy a bottle of Champagne from a reputable brand, rest assured you will likely be looking at a couple of decades before it is deemed to be heading down a slippery slope. “Most of them have at least two decades of pretty decent shelf life. For example, 1986 is already on the downside, but 1988 is still a baby; it’s fantastic vintage that’s fantastic to drink today, fantastic to drink yesterday, and will probably be fantastic to drink in 10 years. “But there’s no set rule: There are exceptional vintages from 1990, 1995, 1996, 2002 and we do not know yet how long you can keep them,” he says. There is no hard and fast rule as to what temperature Champagne should be served at either. “It’s all trial and error,” says Legras. Over-chilled Champagne may appear “closed”, but if the Champagne is served too warm, the bubbles will fade quickly. “A rule of thumb is to serve the Champagne at around 6°C to 7°C as it will slowly get warmer. You will be able to smell the change in the Champagne as it warms up,” he adds. The Legras & Haas Exigence, considered the most unique Champagne in the range, was bottled for the first time in 1997. Its name is a reference to the family’s dedication to creativity and excellence. “It refers to a mindset of excellence; to do the absolute best you can at each step of the making. Attention to detail is what makes the difference between average and good, nice and delicious,” says Legras. At Legras & Haas, the base wines are kept in big stainless steel vats. “Some we keep for the sheer quality, and others we keep because they are not quite ready yet. Indeed, it’s like a bibliothek, a library of raw wines to make Champagne that we can just grab as and when needed,” he says. United Asia Trading (M) Sdn Bhd is the local importer of Legras & Haas Champagne. Call 03-2303 5121 for enquiries.